Secretary Geithner: Ultimately, fiscal policy is about getting the conditions right for economic growth, prosperity, and job creation. Over the past two decades, Washington ran an experiment on that front. In the 1990s, the government put an end to budget deficits, and America enjoyed a period of growth led by the private sector where prosperity was widely shared and job creation was robust. Over the next decade, Washington tried a new path, running up huge debts, while incomes for most Americans stagnated and job creation was anemic. We are living today with the damage that misguided policy caused. So, as we look to a new decade, there’s some empirical evidence around what works and what doesn’t. Rather than creating a false prosperity fueled by debt and passing the bills on to the next generation, we need to restore America to a pro-growth tax and fiscal policy, where the middle class once again has a chance to prosper. Secretary Geithner: Borrowing to finance tax cuts for the top two percent would be a $700 billion fiscal mistake. It’s not the prescription the economy needs right now, and the country can’t afford it. It’s disappointing to see this from Secretary Geithner, whom I see as the least partisan member of the Obama economic team. Tradition suggests I should respond by engaging on the other side of the Secretary’s partisan comparison. This is not, however, a debate between two economic philosophies, but instead a debate among three: Clinton, Bush, and Obama. The Secretary makes an important mistake by suggesting that the Obama Administration is returning to the fiscal policies of the Clinton Administration. 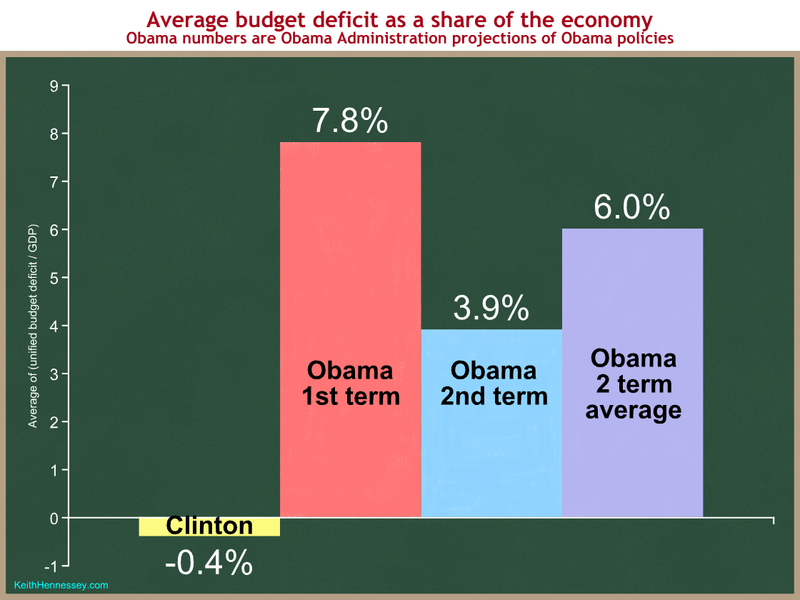 In addition, Obama v. Bush debates are almost always colored by a heavy partisan tinge, so let’s see if we can learn anything by comparing Clinton to Obama on both fiscal policy and economic results. the Obama policies will once again produce a strong economy like we saw in the 90s. I disagree with (1) but today I want to focus on (2) and (3). 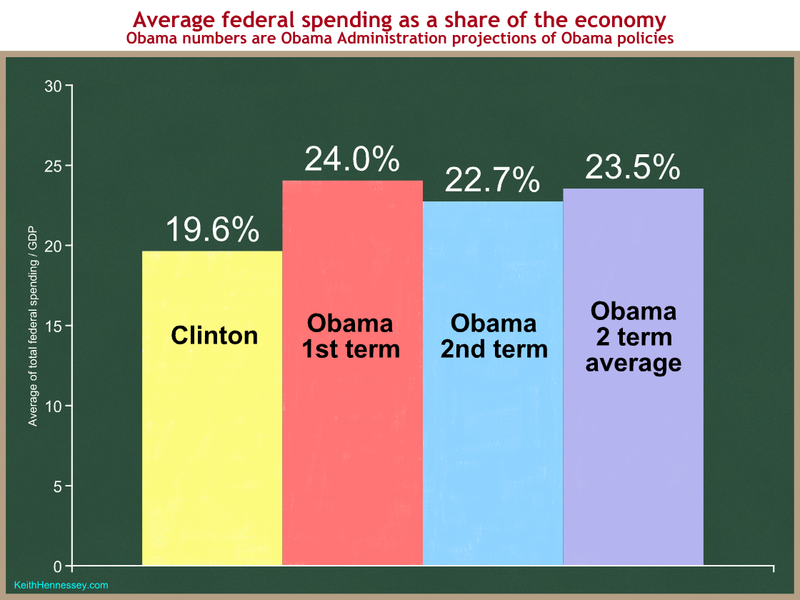 I believe the following data will disprove both claims using the Obama Administration’s own numbers. 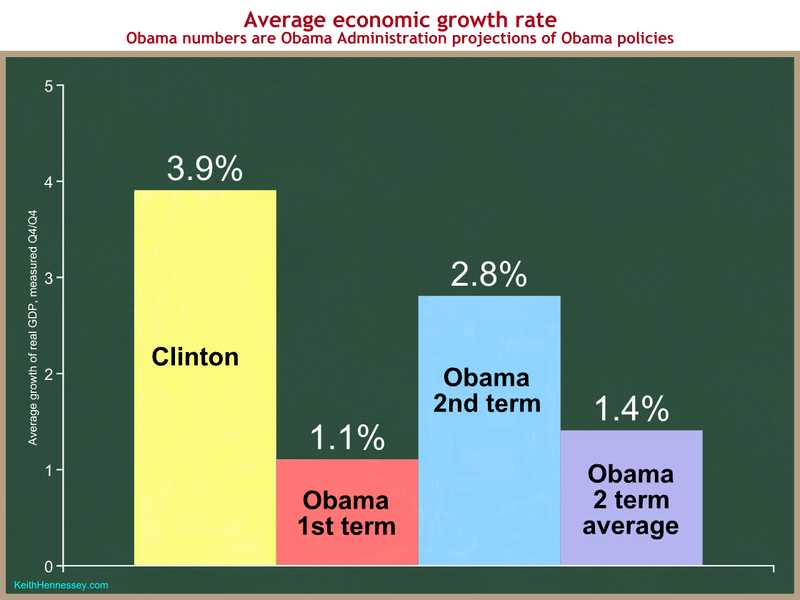 Here are the Clinton actuals vs. projections for the Obama tenure as projected by the Obama Administration. That’s a lot of numbers. Here are my data and sources. Since a two-term Presidency affects nine fiscal years rather than eight, that’s how I’m calculating the averages. For an explanation of this logic see this post. If you think my logic is bad, you can see the calculations for eight-year averages in my backup spreadsheet. You’ll see that the conclusions don’t change, and in most cases my preferred methodology actually makes President Obama’s numbers look slightly better. 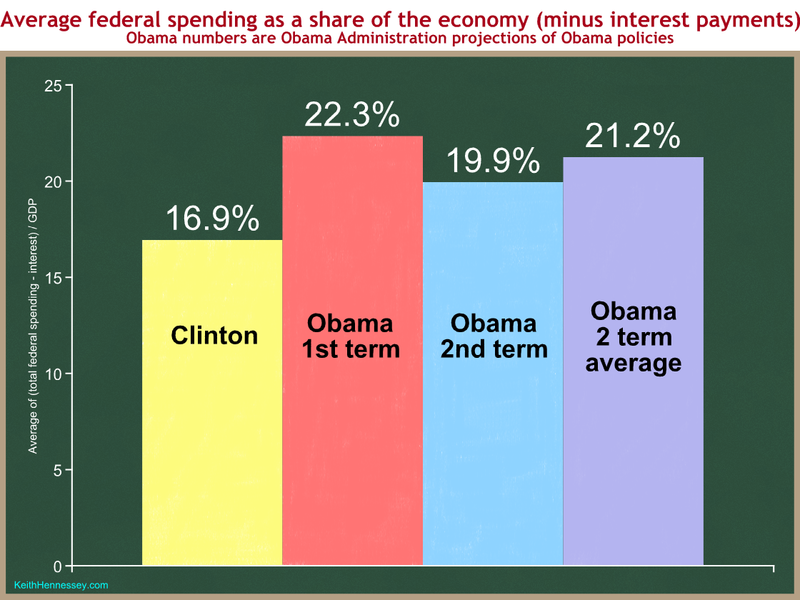 Team Obama projects that, if President Obama’s policies were implemented as he proposes them, average federal spending would be a dramatically larger share of the economy than it was under President Clinton. Based on this graph I don’t see how Secretary Geithner can suggest that President Obama is returning to the fiscal policies of the 1990s. As much as I’m trying to make this not about the Bush tenure, some smart reader is saying to himself, “Yes, but Obama has to pay interest on the debt accumulated during the Bush Administration.” So let’s remove interest payments from both Clinton and Obama’s spending and compare them. All columns are lower, but the comparison looks the same. President Obama would have a federal government more than four percentage points larger than President Clinton had, measured as a share of the economy. If President Obama has only one term it would be 5.4 percentage points larger. The higher Obama spending cannot be blamed on the additional debt he inherited from policies implemented during the Bush Administration. Now let’s look at deficits. President Clinton averaged a surplus over his tenure. Using President Obama’s own projections of his policies, the budget deficit would average 7.8% of GDP over a first term, and 6% of GDP over two terms if he were reelected. Once again, it is absurd for Secretary Geithner to suggest that President Obama is returning to the Clinton fiscal policies. I hope these graphs disprove the Secretary’s implication that, by supporting a tax increase effective January 1, President Obama is somehow returning to the Clinton Administration’s fiscal policies. 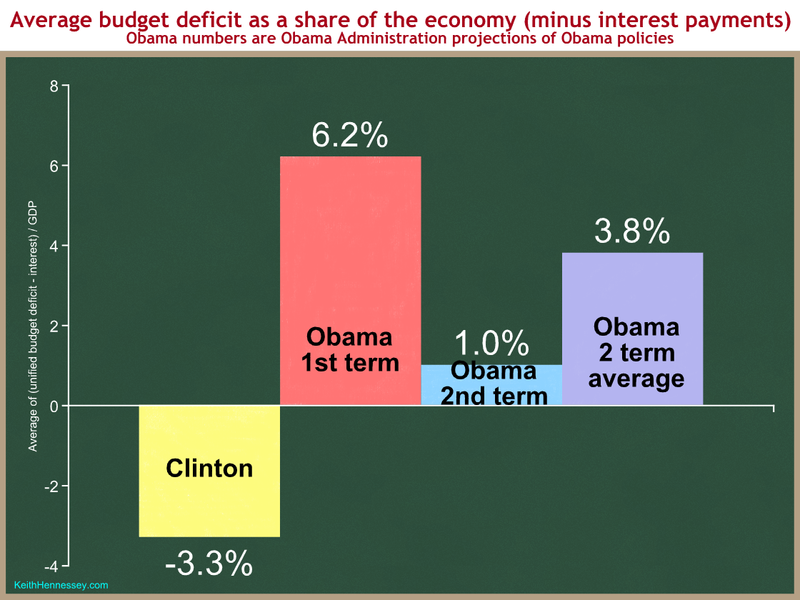 If anything, leaving out interest payments makes Obama’s fiscal policies look relatively worse. Now let’s examine two measures of results, the unemployment rate and the growth rate of real GDP. 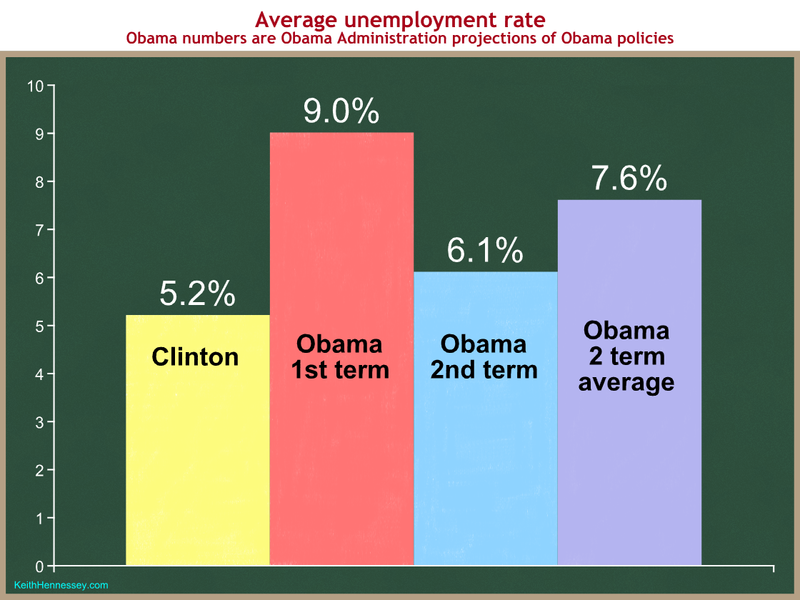 Team Obama projects that the President’s policies would result in 9 percent average unemployment over the President’s first term, and 7.6 percent average unemployment over two terms. Compare that to the 5.2% average unemployment rate during the Clinton Administration. Even in a hypothetical second term, after the financial shock is more than four years behind us, the Obama team estimates unemployment would average more than six percent in a second Obama term, worse than the average over the entire Clinton presidency. And how about real economic growth? This graph depresses me. The Secretary’s op-ed yesterday was titled “Welcome to the Recovery,” yet he and his colleagues project an average of only 1.4% real GDP growth over a two-term Presidency. The good news is that everyone (and I do mean everyone) is just making wild guesses about GDP growth and the unemployment rate beyond one year in the future. Nobody really has any clue what the economy will look like two, three, or six years from now. Washington and the press corps gravitate to partisan fights like Bush v. Obama. The Secretary’s remarks today feed that tendency. I believe the claims of the Clinton team that their policies caused the strong economic growth are exaggerations, and some other time I will engage in that debate. For today what’s most important is that the Obama fiscal policies are vastly different than those of the Clinton Administration, and the Administration’s own estimates project economic results far worse than we saw in the 90s. I agree with Secretary Geithner Secretary that we need to restore America to a pro-growth tax and fiscal policy. I just don’t think that government spending of 24% of GDP, budget deficits averaging 6% of GDP, and raising taxes on successful small business owners during a weak recovery are that policy.